This entry was posted on Saturday, January 14th, 2012 at 22:17	and tagged with 2012, ideas, inspiration, interview, Newspapars, short story, stories, writer and posted in Uncategorized, Writing. You can follow any responses to this entry through the RSS 2.0 feed. Congrats on the newpaper story. Who needs to buy a book of writing prompts, when they have a newpaper nearby? These are fantasic ideas! Thanks so much! BTW, congrats on making the paper yourself! Since I started blogging I have become so much more observant in my day-to-day life – looking out for strange juxtapositions, interesting combinations and funny sights and words. Thanks for the good tips! Lovely – I really like your direct style and strong useful ideas. Newspapers are so much more than tomorrows fish and chip paper. I love reading the paper, from the main articles to the small columns and tiny fill-space stories that probably nobody pays much attention to. I often read stories that give me great ideas and always regret later when I realise I haven’t made a note of them and the paper lies at the bottom of the recycling bin! 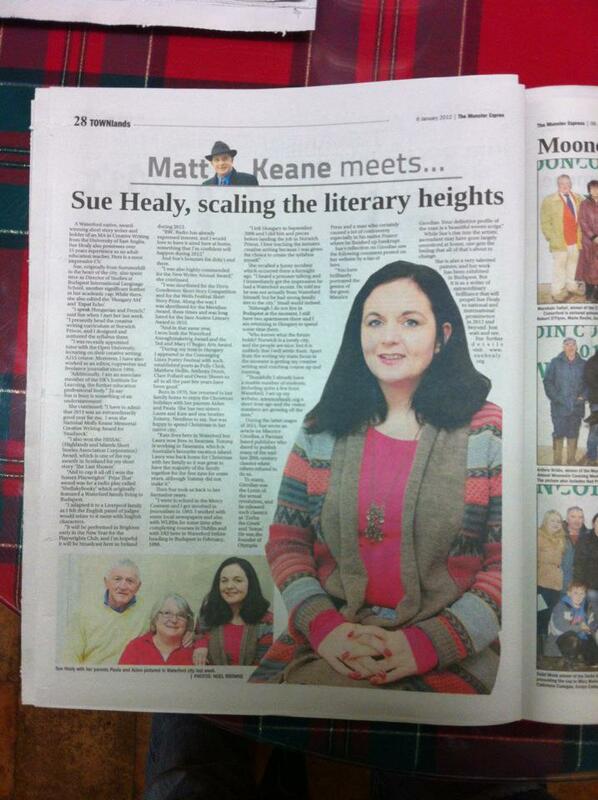 Congrats on your newspaper article Sue! Not only have you given wonderful tips for creative writers, but you also are doing a valuable service by promoting “real” newspapers. It’s so sad to see so many newspapers closing up shop as people turn toward the internet or television for their sole source of current events. I know many people, like me, who prefer the feeling of holding a newspaper in their hands, and reading each page at their leisure. Two of my children are photojournalists/photographers. They would applaud your post as I do! Thanks! I think this is probably a great place and time to say “Congrats!” And great layout on the newspaper! LUCKY! I’m enjoying taking pauses during my writing/research days to read some of your blog posts. They are often like energy drinks or a good cup of strong coffee for the laborer in the field of story (or a refreshing glass of water). May you keep a stillpoint and balance within all the new changes in your life. I am reminded of a Shakespeare quote (can’t find it) about stories being everywhere, i.e. streams, stones, and rocks. Newspapers throb with a desire for someone to tell the story behind the story. As I am beginning my move now, I empathize with the stress of your move. I hope it’s all behind you now, and that your muse comes prancing in with a suitcase full of new thoughts in her new home. And that newspaper layout is beautiful! Congratulations on a great start to the new year. your ideas inspires every one.I promise to stick to them as I write. I really liked this post on using newspapers for prompts. Wonderful blog. And, thank you for the follow. How I wish to read/see myself on a newspaper..